On Saturday evening, we had a very remarkable festival of youth where we heard quite astonishing testimonies from young people, coming out of the most awful circumstances, and finding their way, often with the help of a priest back to a stability in their lives. Among the vast audience was a group of youngsters from All Saints School in Dagenham. They came to Mass in the English College the next day. 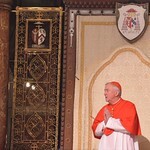 They showed a real appreciation of the centrality of the Mass. I thought it a great privilege to be able to tell them a little about the college that they were in and what a central place it had in the discernment of vocations for people over the centuries. I told them a bit about the history of the martyrs of the college and how that story illustrates two of the great themes of the synod. In the first place, there was a peer group; there was a great bond between the students here in the college so that they could face with courage the journey back home to almost-certain martyrdom, knowing that their colleagues would sing a hymn of praise to God at the news of their going to heaven. And also they were accompanied by saints, by Philip Neri, by Charles Borromeo whom they would visit on their way home in Milan. And so we can draw from this history rich memories to help us at present and help us to look to the future. I think the highlight for me of these first days of the synod is the readiness, especially of the bishops of the synod, to face the deeply troubling and uncomfortable truths about the past in the Church and, to some extent, present, which have been laid before the world in the reports of childhood abuse and neglect of Church leaders. It’s the way that it has not been pushed to one side; it has been brought into every discussion and it’s a kind of context. That’s right because much of the accompanying of young people and often of their vocation discernment depends on trust and it’s precisely trust that has been damaged. Together we have to rebuild it.